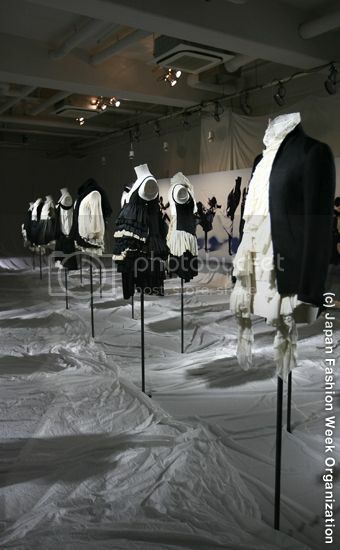 Discussion in 'Designers and Collections' started by runner, Oct 21, 2009. lovely!!! that first look is particularly interesting in that it could translate for man's silhouette too. all those cascading raw frills layered beneath a lean,tailored jacket....count me in! wow .. can't spot a piece I would not love to acquire here, it's beautiful through and through. 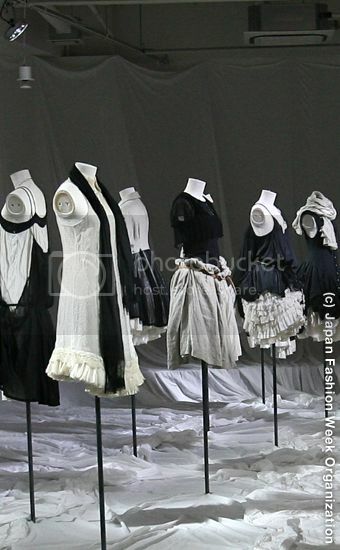 ohhh i always love looking at japanese designers.. it's all very soft and feminine without being overly girly... beautiful! I adore every single piece from that collection. I'd wear it anytime! he gets only better each season... I am so enchanted with his clothing, it's become the collection I'm most excited to see lately. just beautiful, simply perfect. This is absolutely stellar... it gets better and better w/ each scroll; a rarity these days. I too would love to own every single piece from this collection. These garments evoke so much charm and wit. It's very elegant and light too but still rather brooding. Gorgeous and inspiring more than anything though. Thanks for the photos Runner and Inaya! i have such a weakness for tiered frills like that. those tiered frills and pleats/tucks/gathers (don't know what you'd call it) seem to have come from piano keys or musical score (staff ?) this time. I would wear all that. What can't the Japanese do? Beautiful collection. Found several pieces I would like to try on!